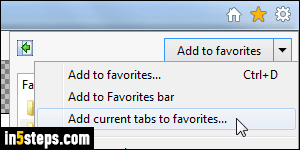 By default, adding a website to your favorites ("bookmarking a site") will place a shortcut to that web page in Internet Explorer's Favorites menu. That approach will become hard to manage as soon as you have more bookmarked sites than space on the menu without scrolling. 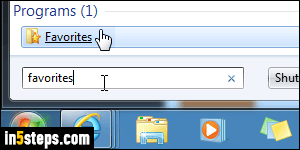 But IE lets you create folders and subfolders in your favorites menu and favorites bar to keep things organized. This tutorial assumes that you are using IE7, IE8, IE9, IE10, or IE11. There are three ways of creating favorite folders: each of them is best for a particular context. The easiest one is when you bookmark a website: if you hit the Ctrl+D keyboard shortcut, the "Add a Favorite" dialog will open. click on the "New folder" button to create a new folder in the Favorites menu itself. To create a subfolder, select a folder (as shown on the screenshot) and then click on the New folder button. Click Add to put that website in the folder/subfolder. Since the latest few versions of IE, you have the ability to add to your favorites all the websites / web pages opened in the current browser window's tabs. This will automatically create a folder, whose name you get to pick when you bookmark those pages. Click on the star icon and choose "Add current tabs to favorites" from the dropdown arrow menu (see screenshot). If you have the IE classic menus showing, that option is the third in the Favorites menu. You can also create folders and subfolders without having to bookmark anything. Click on the star icon in the upper right corner of the window, and click on the dropdown arrow as shown on the screenshot. 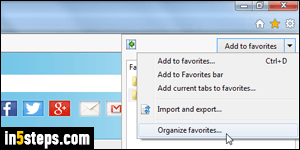 After clicking "Organize favorites", the popup that opens allows you to create folders just like you would in Windows Explorer. Click on any existing favorites folder to open it, and click on the "New folder" button to create a subfolder inside it. Behind-the-scenes, your Internet Explorer favorites are actually regular Windows shortcuts inside a "Favorites" folder under your profile. Anything you store in that folder will appear in the Favorites menu and dropdown on the right. 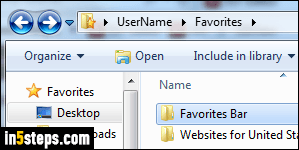 To view and manage your favorites in Windows Explorer, just type the word "favorites" in the start menu and hit Enter (or click on the folder icon).